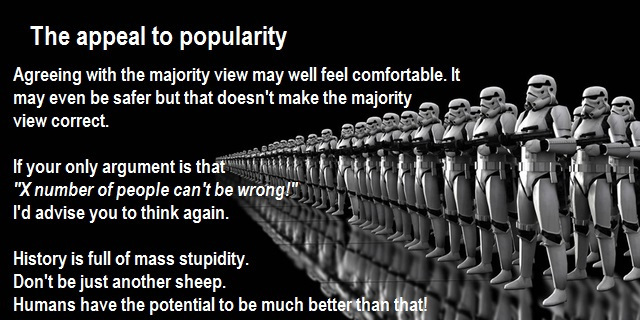 The appeal to popular belief – also known as the Argumentum ad populum – is the logical fallacy that states that if most or many people in general or of a particular group accept a belief as true, it is evidence that the claim must be true. Accepting another person’s belief, or many people’s beliefs, without demanding evidence as to why that person accepts the belief, is lazy thinking and a dangerous way to accept information. Just because every Stormtrooper thinks that the Death Star cannot be destroyed, doesn’t mean it’s true. The appeal to popular belief is used in many pseudoscience arguments by stating that because 90% of Americans believe that X is true, then X must surely be true. For example, over 60% of Americans believe creationism is true, so evolution must be false.